This is one of the 7 climbing routes to the summit of mount Kilimanjaro, and the only one that provides cabin accommodation at all rest stops. It is known for being the easiest route of them all because it takes a more gentle and longer path up the mountain, and has comfortable accommodation options available at all camp sites. However,the gentle inclines mean that most of the treks are longer, with a minimum trek from one stop to another being about 11km. Although not entirely clear why, it has been nicknamed the coca-cola route, with some of the guides and locals saying that this is because of the relative ease with which a climber could finish it when compared to the others. Others say that the name rose due to the availability of coca cola's at every rest stop. Trek from Marangu gate to Mandara hutsThis day usually starts in the afternoon, after a drive to the Marangu gate during the morning and registration with the park authorities there. Most tour companies would introduce you to your guides and porters at this location before setting off on your trek. Much of the path goes through the montane forest, reaching Mandara huts in the evening and spending a night there. For those who arrive at this point early, there is an optional trek to Maundi crater that is less than 1 Km away for some sight seeing. Trek from Mandara huts to Horombo hutsDay 2 begins early in the morning after breakfast, with the start of the trail taking you through the last part of the montane forest before emerging into the heath region. Near this border is Maundi crater, a short detour along the path that you may visit if you didn't get the chance on the previous day. Otherwise the path continues through the heath and into a sequence of hills and valleys, culminating at Horombo huts in the mountain's moorland where you spend another night. Acclimatization trek to Zebra rocks (optional)Day 3 is usually an acclimatization day, involving a thirty minutes trek from Horombo huts to Zebra rocks and back; However the 5 day trek skips day 3 and goes straight to day 4. The short trek can start at any time in the morning or afternoon, with much of the path taking you through the moorland and up a hill that is actually part of the Mawenzi ridge that goes through the area. Trek from Horombo huts to kibo hutsDay 4 starts early in the morning after breakfast, going up the same ridge that was traversed on day 3, but on a different and parallel path. The path cuts through the remaining moorland before finally descending into the vast plains that are the alpine desert region and making a short ascent to Kibo huts for a rest until midnight. 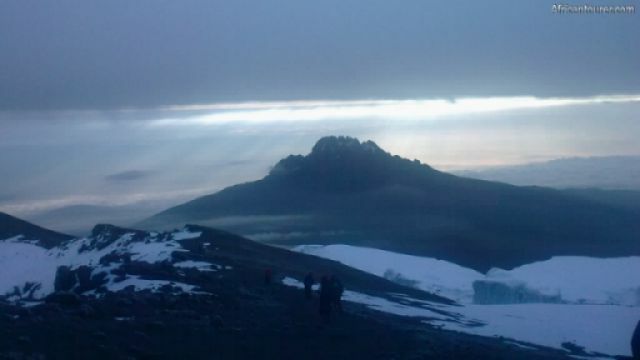 Summit attempt, climb from Kibo huts to Uhuru peak and descent to Horombo hutsThis is the toughest part of the route, partly because it starts at midnight thus denying any trekker the sufficient rest times required. The other reason is that unlike the rest of the route, most of the climb up to the summit involves meandering through scree filled slopes that make sure for every one step up the mountain you take half a step downward. Not to forget the rapid altitude change from Kibo huts to Gilman's point that is done during the cold of the night, in the dark and one of the coldest areas of the mountain; however, after about 5 hours you get to Gilman's point and the path from here to the peak is much easier, taking you through Stella point and normally reaching the summit anytime from just before dawn to after dawn. Then on the same day, you make a descent from the summit through Kibo huts and finally spending a night back at Horombo huts. Note that this is the standard route, tailor made routes are available and may follow a different schedule e.g. some do the whole route in two days where as others do it in 10 days. The map below further illustrates the Marangu route path and all the points involved. Click anywhere on it to start the map and on a point (green marker) to view further information about it. Are you associated with Marangu trekking route? Contact us to improve this page or create another page for your business.